The rufous woodpecker (Micropternus brachyurus) belongs to the family of sapsuckers and woodpeckers, the Picidae. The rufous woodpecker species is distributed in India, Nepal, Bhutan, Bangladesh, Sri Lanka, southeast Asia and China. These woodpecker populations are under decline due to habitat destruction. These woodpeckers are polytypic species. The rufous woodpecker (Micropternus brachyurus) is a medium-sized woodpecker, measuring 25 to 30 cm in length and weighing 55 to 115 grams. The rufous woodpecker has overall reddish brown plumage. There is a short crest. There are dark bars and vermiculations on the rufous body. The males have reddish patch near the eye. The bill is short, pointed, slightly curved and dark gray in color. The irises are dark brown. There is a gray eye-ring. The legs and feet are gray. The call of the rufous woodpecker is a nasal "kweep..kweep..kweep" sound. These rufous woodpecker (Micropternus brachyurus) species are distributed in India, Nepal, Bhutan, Bangladesh, Sri Lanka, Myanmar, Thailand, Cambodia, Laos, Vietnam, Malaysia, Singapore, Brunei, Indonesia and China. In India, these rufous woodpecker species are distributed in the states of Tamil Nadu, Kerala, Karnataka, Andhra Pradesh, Telangana, Maharashtra, Gujarat, Madhya Pradesh, Chhattisgarh, Odisha, Jharkhand, West Bengal, Uttar Pradesh, Uttarakhand, Bihar, Sikkim, Assam, Meghalaya, Arunachal Pradesh, Manipur, Nagaland, Tripura and Mizoram. The nominate rufous woodpecker subspecies M. b. brachyurus is distributed in Java (Indonesia). The subspecies M. b. badiosus is distributed in Borneo and north Natuna Islands (Indonesia). The rufous woodpecker subspecies M. b. badius is distributed in Sumatra (Indonesia) and Malay Peninsula. The subspecies M. b. annamensis is distributed in Vietnam, Cambodia and Laos. The subspecies M. b. humei occurs in North India and west Nepal. The woodpecker subspecies M. b. williamsoni is distributed in Thailand. The subspecies M. b. holroydi is distributed in Hainan (China). The subspecies M. b. fokiensis is distributed in southeast China and northern Vietnam. The rufous woodpecker subspecies M. b. phaioceps is distributed in Nepal, east and northeast India, southern China, Myanmar and northern Thailand. The subspecies M. b. jerdonii occurs in west, southwest India and Sri lanka. 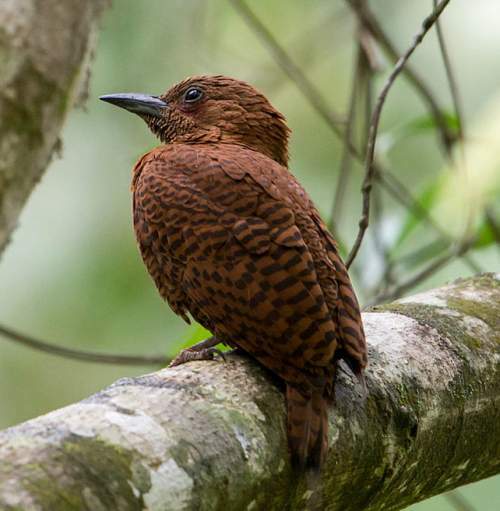 These rufous woodpecker species have moderate forest dependence. They normally occur in altitudes from 0 to 1740 meters. The artificial ecosystems and habitats of these woodpecker species include plantations and rural gardens. The natural ecosystems and habitats of these rufous woodpecker species include tropical and subtropical moist montane forests, evergreen forests, deciduous forests, moist lowland forests, moist shrublands, dry forests and mangrove forests. 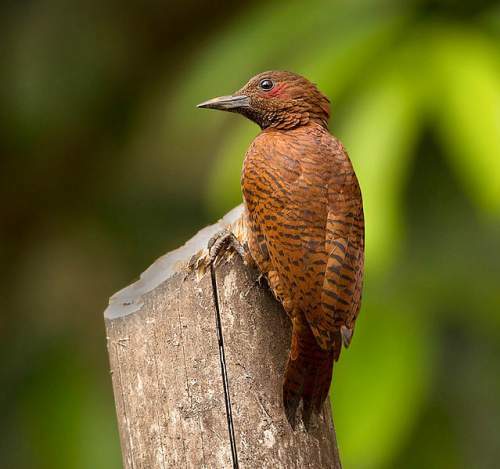 The diet of these rufous woodpecker (Micropternus brachyurus) species consists mainly of ants. Arboreal ants, ant larvae, termites and other small insects are their primary food. The Oecophylla species (weaver ants or green ants), Pheidole species and Crematogaster species (Saint Valentine ants and acrobat ants) are the favored prey of these woodpeckers. 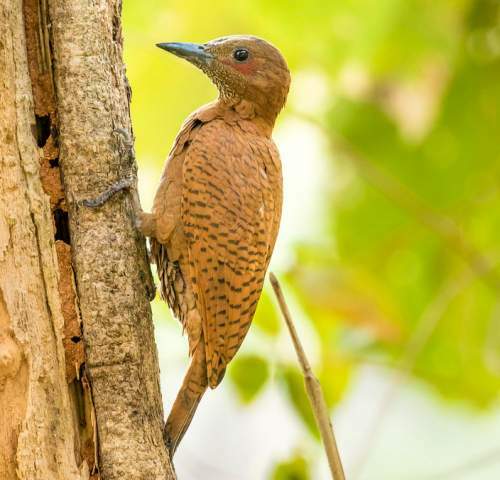 The breeding season of these rufous woodpecker species is from February to June in south India and Sri Lanka. The laying season is from April to June in Nepal, north India and Myanmar. The breeding season is from January to April in Malaysia and Thailand. These rufous woodpecker species are monogamous and aggressive. The nesting sites include fork and branches of trees. They nest within the arboreal nest of acrobat ants. The clutch contains two or four round white eggs. Both the parents incubate the eggs and raise their young. The chicks hatch out after 11–14 days of incubation. The young woodpeckers fledge after 20-25 days. These woodpecker species are non-migratory resident birds. The populations in higher altitudes descent to lower levels in winter. The global population size of the rufous woodpecker (Micropternus brachyurus) has not been quantified. The overall population trend of the species is considered to be decreasing. In most of its range, this woodpecker species is reported to be locally common to uncommon (del Hoyo et al. 2002). The generation length is 5 years. Its distribution size is about 16,800,000 sq.km. Habitat alteration, fragmentation and destruction, deforestation and human intrusions and disturbance are the main threats that are endangering the survival of these species. The rufous woodpecker (Micropternus brachyurus) does not approach the thresholds for being Vulnerable, either under the range size criterion, or under the population trend criterion or under the population size criterion. The IUCN (International Union for Conservation of Nature) has categorized and evaluated the woodpecker species and has listed it as of "Least Concern". The CITES (Convention on International Trade in Endangered Species of Wild Fauna and Flora) status is ‘Not Evaluated’ for the rufous woodpecker (Micropternus brachyurus). M. b. holroydi Swinhoe, 1870. Current topic in Birds of India: Rufous woodpecker - Micropternus brachyurus.